What does it mean to be an artist in the modern world? What does it take to develop your craft? What does it take to earn a living from your art? My special guest on Voices from the North, Duncan Kapa, is a master wood carver in the Maori (whakairo) tradition, although he’s reluctant to use the term, ‘master’. This interview is touching. Duncan’s journey is one of the heart. At seventeen he walked away from the dreams his family had for him to follow his own. He faced ridicule and criticism. But he had no choice if he was to be true to himself. Now, after something like thirty years of practising his craft he’s earned the respect of his peers and of the public (and, I suspect, of his family). He is a humble man and an inspiring one. 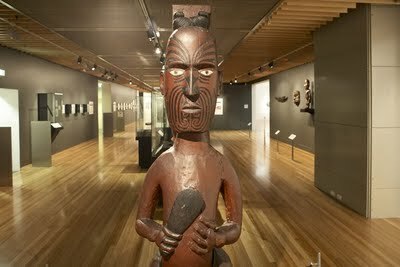 In pre-European days carvers were some of the very few people who could freely and safely navigate between iwi (tribes) at war. Such was the respect afforded them. For ten years Duncan has lived in Wellington. He considers New Zealand’s capital to be a Mecca for the arts. ‘Artisans need to be in a sharing artistic environment,’ says Duncan Kapa. ‘Artists feed off each other.’ I suspect they understand each other as well, and that goes a long way in world in which there is rarely a regular pay check. It’s often feast or famine, although Duncan hopes the days of famine are behind him now. Great post and love the photo. Beautiful focus on the artpiece.